Across the U.S., there has been turmoil surrounding various bathroom laws — either regulations that are more inclusive or those that are more exclusive. In California, all business establishments, places of public accommodation, or government agencies in California with single-occupancy restrooms are now required to identify such toilet facilities as all-gender restrooms. In September 2016, California state governor Jerry Brown signed into law Assembly Bill 1732 (now codified as California Health and Safety Code section 118600), effective March 1, 2017. 1. What is the purpose of the new law? California Assembly member Philip Y. Yang (D-San Francisco) has explained that the purpose of the new California law is to ensure the safety, fairness, and convenience of access to everyone, as single-gender, single-use restrooms have disproportionately burdened the lesbian, gay, bisexual, transgender, queer/questioning, intersex, and asexual/agender/aromantic (LGBTQIA) community, women, and parents or caretakers of dependents of the opposite gender. 2. What’s the new bathroom law about? The new law, called the California Equal Restroom Access Act, requires all California businesses, public facilities, and government agencies that have single-use toilet facilities (meaning, a restroom with no more than one water closet and one urinal with a locking mechanism controlled by the user) to permit any person regardless of gender identity to use those restrooms. 3. What does the new law require? 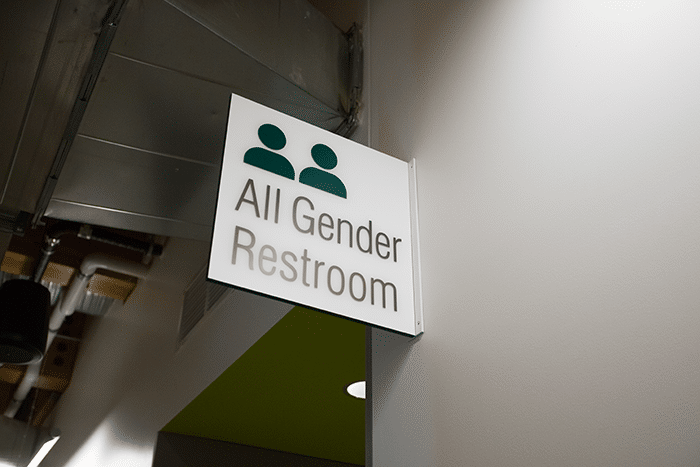 Business establishments, places of public accommodation, or government agencies with single-occupancy restrooms are required to re-designate such restrooms as “unisex” in compliance with Title 24 of the California Code of Regulations, Building Code (“CBC”) Chapter 11B, by putting a geometric symbol on the door that is an equilateral triangle superimposed onto a circle, as well as a tactile (i.e., capable of being read by touch) sign that indicates that the facility is a restroom. 4. What is the new restroom door symbol supposed to look like? 5. If my business does not put a sign on the door directly, but there is a restroom sign on the wall next to the door, what is required? While CBC Chapter 11B does not require a wall-mounted designation sign, if a business or agency elects to post a sign adjacent to the restroom facility door, the sign is required to comply with the technical requirements for visual characters, raised characters, braille, and must also comply with other accessibility requirements for mounting height, clear floor space, and proximity to the door/entrance of the room. 6. How will the law be enforced? The new law authorizes public inspectors or building officials to conduct inspections for compliance with the law. Alex is an attorney at law with extensive experience navigating complex class action and representative action disputes under California’s Private Attorney General Act of 2004. Alex also has significant experience defending against single plaintiff claims for violations of California’s wage-and-hour laws including claims for missed meal and rest breaks, unpaid overtime, business expense reimbursements, and misclassification, as well as claims for wrongful termination, retaliation, harassment, and discrimination. Alex has been named by Super Lawyers as a “Southern California Rising Star” in 2014, 2015, and 2016.